The world’s longest stand up paddle race, the SUP 11 City Tour, is happening all this week has just finished in the Netherlands. 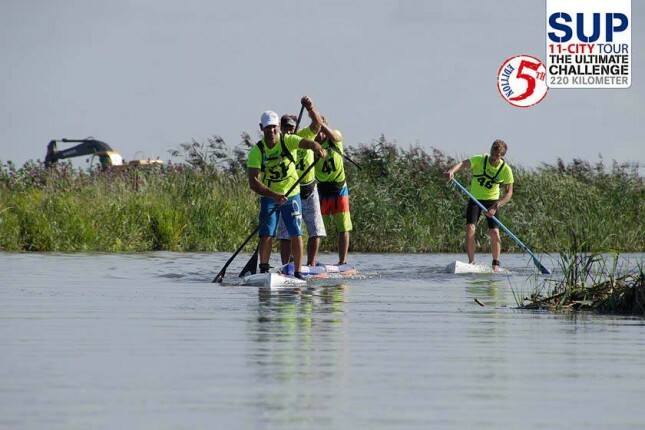 From the 4th to 8th of September competitors will paddle the 220km course in five separate stages, Tour de France-style, making it one of the hardest races in the world of SUP racing. Stage One (Wednesday 4th September): 45kms. It was a solid performance today by Peter Bartl of Austria, the third place getter in the 2012 Tour and another of the pre-race favourites. Peter crossed the line in five hours flat, gaining almost two minutes on Bart and putting himself in a good position for the remainder of the week. Meanwhile Marie Buchanan from the UK was dominant in the women’s, finishing 8 minutes ahead of Melanie Brandstatter. One of the pre-race favourites, Ryan James from the UK (3rd in 2011) pulled out early in the race due to illness. Stage Two (Thursday 5th September): 42kms. Again it was Peter Bartl who took the win to extend his lead over Bart de Zwart. Conditions were described as good but almost “too good” – it’s hot and there’s no wind, which makes 40-45kms of flat water paddling a long hard grind. Melanie Brandstatter made up some ground on Marie Buchanan on the women’s, though is still six minutes behind the Englishwoman. Stage Four (Saturday 7th September): 45kms. Bart de Zwart took the stage win for the second day running, meaning he and Peter Bartl have two stage wins apiece. However Peter stuck with the defending champ all day, so the time difference was negligible. That still gives the Austrian a three minute lead over Bart heading into the final day. Melanie Brandstatter won the women’s stage but Marie Buchanan was right behind her, so the Englishwoman will take a big lead into the fifth and final stage. Full results below. Stage Five (Sunday 8th September): 30kms. Peter Bartl began today’s fifth & final stage with a three minute lead, knowing that he only had to stick with Bart and he’d score the overall Tour victory. That’s exactly what happened; despite Bart taking out his third stage win in a row, Peter hung on all day to claim the 2013 SUP 11 City Tour. Meanwhile despite Melanie Brandstatter winning another stage today, Marie Buchanan took the overall title by over six minutes. Also check out Bart de Zwart’s SUP 11 City Tour recap for some great insights into this unique race. There are five stages from 4th-8th September. All paddlers begin each stage at the same time. Overall combined time wins (Tour de France-style). Click the image below to get Bart de Zwart’s excellent daily insights into the SUP 11 City Tour.